Der König der Löwen Ummmm... All related? My sister made a very good point a few weeks ago. If Mufasa and Scar are brothers... that makes alot of people in this movie related. Simba is Mufasa's son, that would make Scar his uncle, and Kiara would be his grand neise. Scar is Zira's father (I think), and she had Kovu. 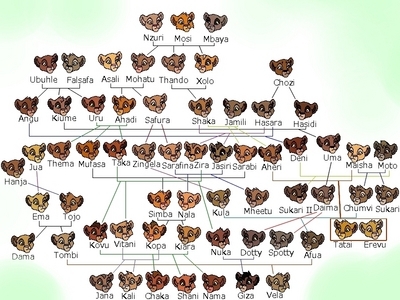 All this makes Kiara and Kovu second cousins. Simba and Zira would be cousins. If Kiara and Kovu are second cousins, how did they end up together? Because they weren't second cousins. We don't have any evidence that Scar is Zira's father. In fact, we have evidence in quite the contrary. 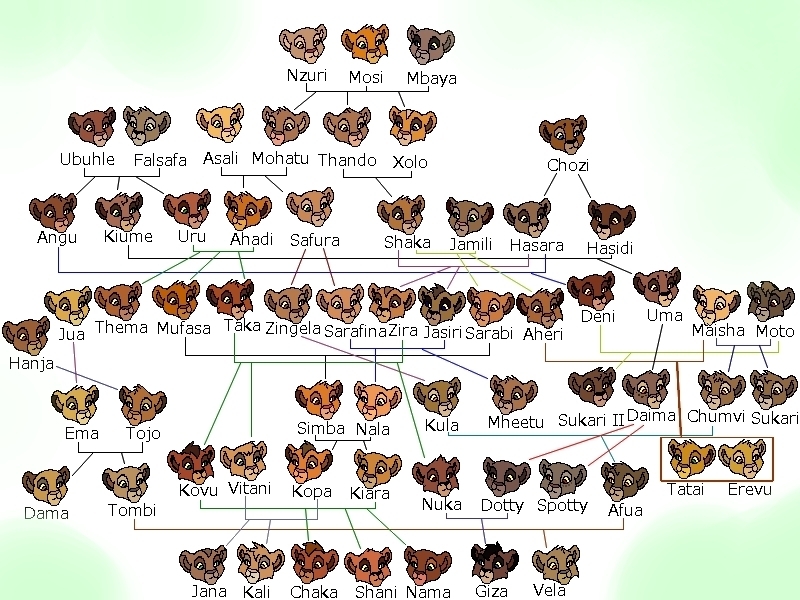 He wasn't Kovu's father, and he isn't even confirmed to be Nuka and Vitani's father, so just as well there might have been other males around before Zira came into the world - which by the way I would think was around the same time as Scar and Mufasa. To me, she seemed around Scar's age in the film. Beside's Zira calls him Scar and not father & talks about him in a very non-child/parent manner. Not really, apparently Kovu origionally was supposed to be Scar's son, but Kiara and Kovu would have to come together so they changed it, even though I do think that Kovu looks too much like Scar. And like bendaimmortal said it hasn't been confirmed that Nuka and Vitani are Scar's, but it would explain a little why Nuka has such a passionate hate for Kovu being "The Chosen One" when it could have been his birth-right. Yeah, and it's been said that Nala's father was either Scar or Mufasa, making Simba and Nala related either way. But they're animals, I don't see why everyone is flipping out about it.